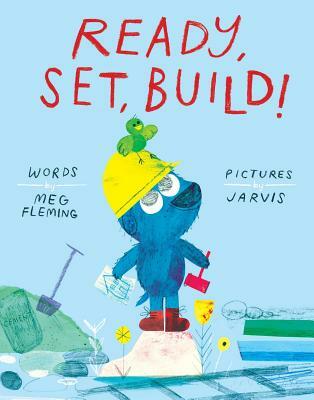 Meg Fleming has built many wonders in the field of construction. Her greatest architectural achievement is a 17-foot gum wrapper chain that she made in the car when she was eleven years old. She loves hatching ideas, then building . . . and building . . . until they become her favorite thing: a story. Meg writes from her home outside of San Francisco, California, with her husband and kids who build things out of wood and wheels, flour and sugar, and bits and bytes. She also has a dog who always wears a hard hat. Please visit Meg at MegFleming.net. Jarvis is the author-illustrator of Lazy Dave and Alan's Big, Scary Teeth. Jarvis has always doodled wherever his career has taken him, from graphic design student to record jacket designer to animation director. He lives in a very leafy and quiet part of Northern England with his girlfriend (who tells him what's good/bad and pretty much gives him most of his ideas) and his cat, who rips those ideas into tiny pieces. Find out more about Jarvis at byjarvis.com.